With corrosion-resistant zinc plating, a durable, poly wheel base and 12-3/4" retracted height, this swivel jack is perfect for marine and other recreational applications. Measures 12-1/2" from mounting bracket to top of jack. 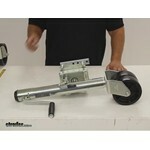 Lowest Prices for the best trailer jack from Fulton. 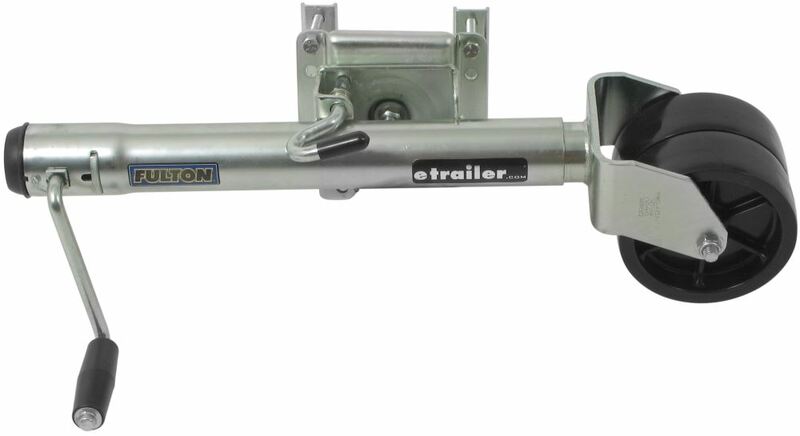 Fulton Bolt-Thru Swivel Marine Jack with Dual Wheels - Sidewind - 12" Lift - 1,500 lbs part number FXPD15L can be ordered online at etrailer.com or call 800-298-8924 for expert service. With corrosion-resistant zinc plating, a durable, poly wheel base and 12-3/4" retracted height, this swivel jack is perfect for marine and other recreational applications. Measures 12-1/2" from mounting bracket to top of jack. Dutton-Lainson sidewind swivel jack with a 6" dual wheel can be a real back saver when hitching and unhitching loaded trailers. Today were going to take a look at the Fulton Bolt-Through swivel marine jack with dual wheels part #: FXPD15L. Jack is finished in the Z-Max 600 zinc finish, its tested with a 600 hour salt spray to make sure its going to be nice and durable for marine applications. The jacks covered by a limited five year warranty, it has a lift capacity of 1,500lbs. There are two wheels at the base of the jack that measure 6 inches in diameter. 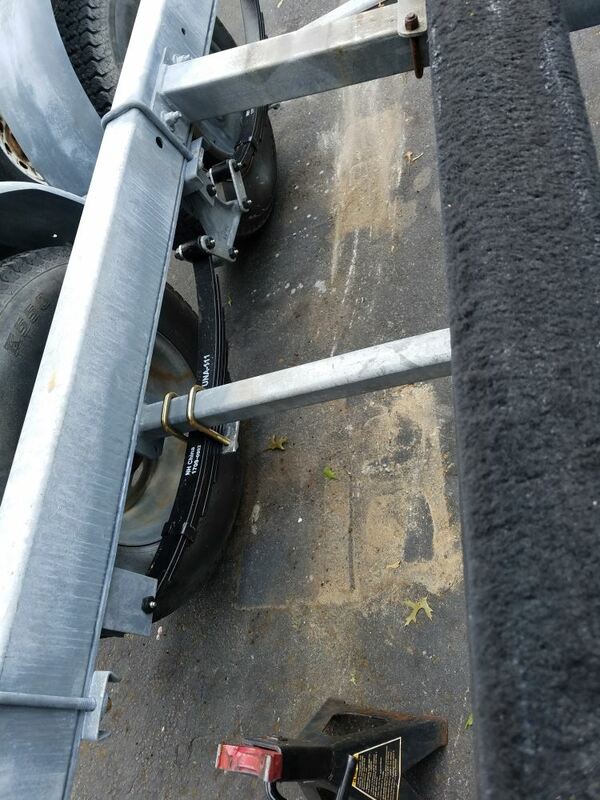 The jack features a pull pin here that will allow to swing the jack up along with the frame of the trailer so that it will up and out of the way when going down the road. 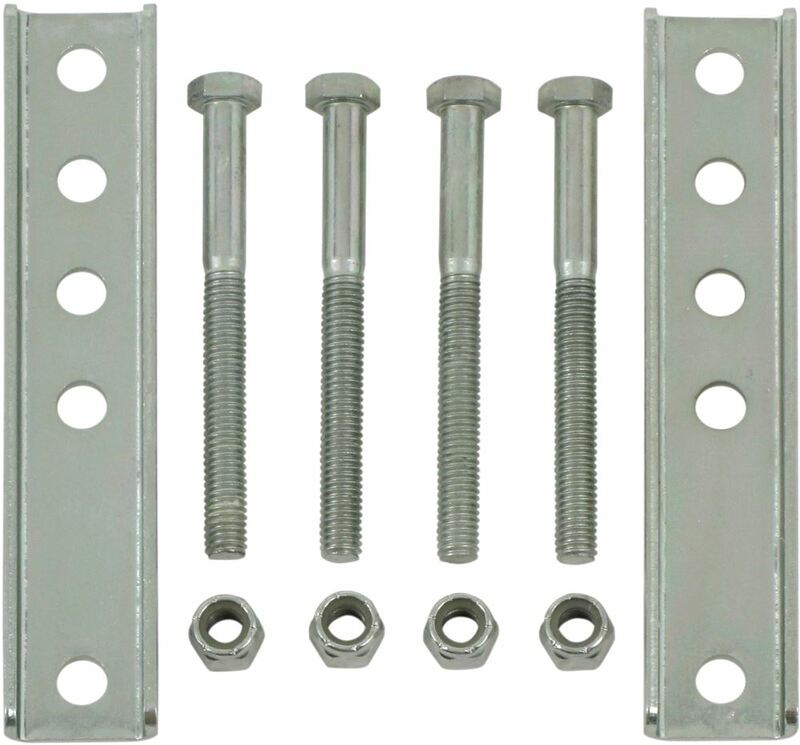 Its a bolt-on design and the mounting hardware is included with the jack so you can bolt it to the frame of your trailer. The tube diameter is 2 inches. There is 12 inches of clearance from the center of our mounting bracket to the top of our jack. This jack is in the fully retracted position and it has a bracket height of 12 inches. Thats from the bottom of our wheel to the center line of our mounting bracket. Now I also have this same jack fully extended. When fully extended the jack has a bracket height of 24 inches. The difference between the two measurements, 12 inches, is the amount of lift the jack will provide. And thats it for our quick look at the Fulton bolt-through swivel marine jack with dual wheels part #: FXPD15L. 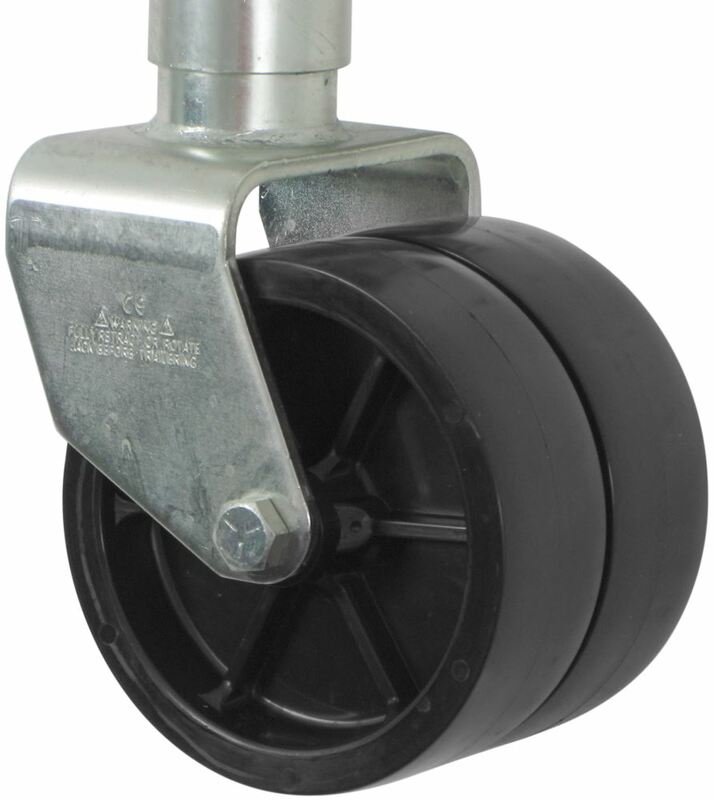 Order: RelevanceNewestRating - High to LowRating - Low to High With corrosion-resistant zinc plating, a durable, poly wheel base and 12-3/4" retracted height, this swivel jack is perfect for marine and other recreational applications. Measures 12-1/2" from mounting bracket to top of jack. It is working fine. I would buy another one when I need to replace an old one. Good Product, happy so far. 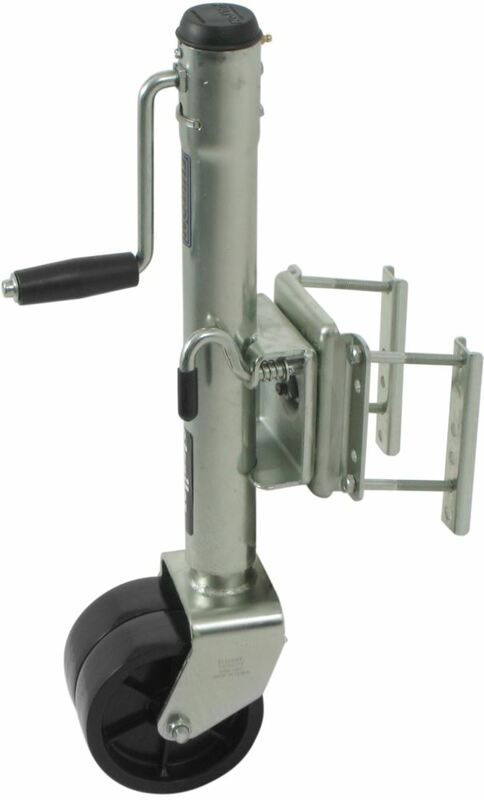 I suggest the Fulton dual-wheel Bolt-Thru Swivel Marine Jack # FXPD15L rated for 1500-lbs. This jack offers 12-inches of lift and features dual 6-inch wheels for easier handling on softer surfaces. 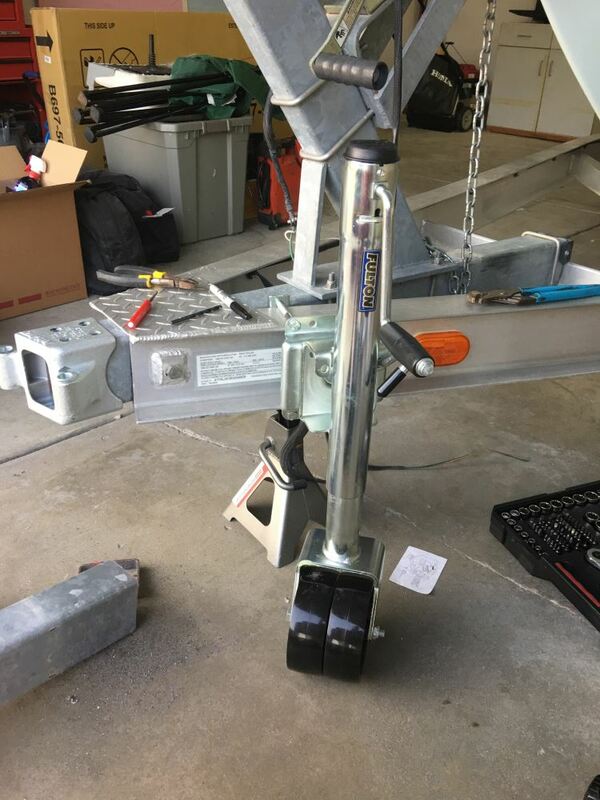 In the event that this jack does not fit your mounting plate you can still install it using the included frame clamps that fit 3 x 5 trailer frames. Having 2 wheels will provide more surface area/contact with the ground. This could actually make it more difficult to maneuver compared to a single wheel. But two wheels are better than one when not on pavement. A single wheel tends to dig into dirt or gravel easier. A Fulton jack such as # FXPD15L is going to be the better jack compared to the MaxxTow line of jacks. I do recommend going with a Fulton. For a single wheel version use # FXP15L. You would need to replace the weld-on jack with another weld-on jack of the same type. The bolt on jacks have a different mounting bracket than the weld-on ones. You could use # FXP15W and you may also need bracket # P9012-00 if the old one turns out to not be compatible. I went and checked out a Fulton Bolt-Thru Swivel Marine Jack # FXPD15L and the only thing that holds the cap on the jack is a screw/bolt that could be removed with a flat head screwdriver or a small wrench. For the gear replacement, you will need the Fulton Bevel Gear Kit, # F0933306S00. 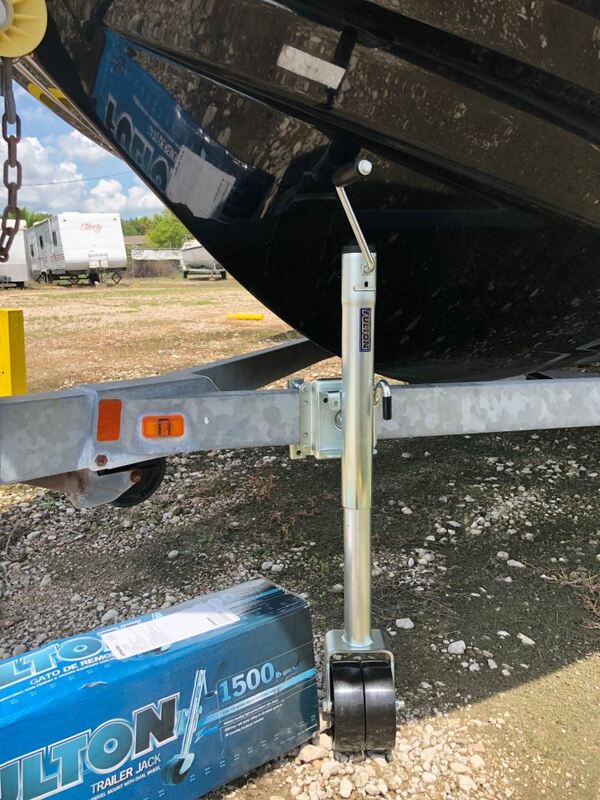 For your Shelby 5856A boat trailer, I recommend the Fulton Bolt-Thru Swivel Marine Jack with Dual Wheels - Sidewind - 12" Lift - 1,500 lbs # FXPD15L. This jack has zinc plating for corrosion resistance and durable poly wheels. For the single wheel option, you can use the Fulton Bolt-Thru Swivel Marine Jack - Bolt On - Sidewind - 12" Lift - 1,500 lbs # FXP15L. 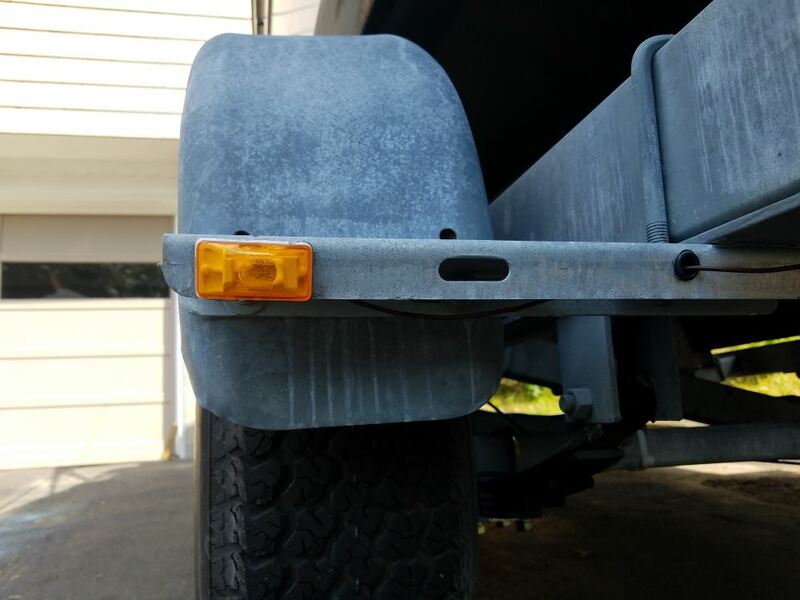 Since a 5-1/2 inch tall frame is not all that common I recommend using Fulton jack # FTJ120W0301 which comes with its own bracket that will need to be welded to the trailer frame. The max trailer frame height limit for most jacks is 5 inches including the part # FXPD15L. 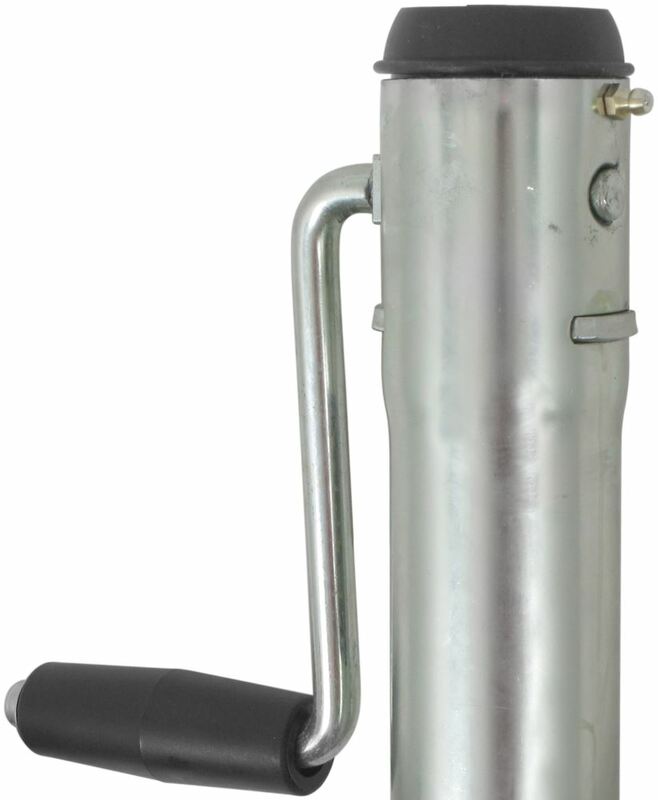 We do carry a replacement handle and gears for the Fulton Bolt-Thru Swivel Marine Jack, # FXPD15L. For the handle, you will need the Replacement Sidewind Handle Kit for Fulton Marine Jacks, # F0933305S00. For the gears, you will need the Fulton Bevel Gear Kit, # F0933306S00. The square washer pieces go in the holes in the jack where the handle goes through the outer tube. One on each side. 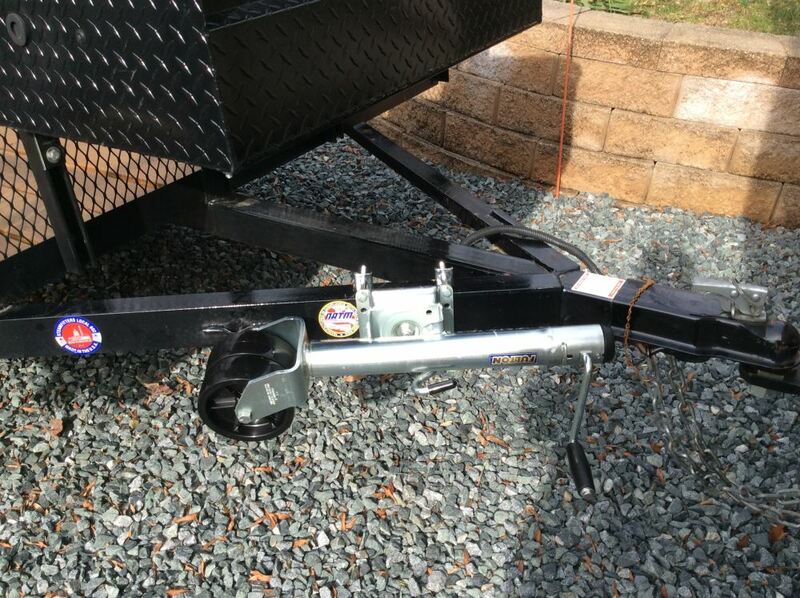 Yes, the Fulton Bolt-Thru Swivel Marine Jack # FXPD15L comes with a bracket designed for fitting 3 incy by 5 inch trailer frames like what you have. We have exactly what you would need. The Fulton Jack part # FXPD15L has a 1,500 lb capacity, has dual wheels, and can fit a 3 by 5 inch trailer frame. The Fulton # FXPD15L jack you mentioned will fit trailer frame members up to 3x5. It will indeed fit your 2x4 trailer frame very well. You can order the jack by using the provided link. I've linked you to a product demonstration video featuring the jack. I spoke with my contact at Fulton and he stated that what you are describing is a symptom of the jack screw inside the jack seizing up. You have a couple of options. First, you can try to take the jack apart and free the screw. If you cannot, the other option is to replace the jack. I have included a link to our trailer jack main page for you to view.